As many of our poker players are aware, Full Tilt offers an online casino that’s complete with blackjack, roulette and slots. And if you’re into casino gaming, you’ll be excited to know that Full Tilt recently launched a live dealer casino too. Now you can experience land-based action – including real dealers, cards and tables – through your laptop. 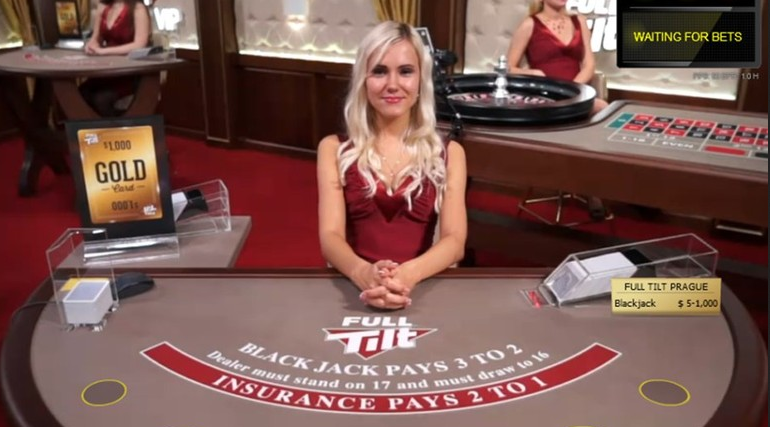 This is definitely an exciting step in the evolution of Full Tilt casino gaming, so let’s discuss what to expect below. Anybody who’s played online poker at Full Tilt before will feel right at home with the live casino. That’s because everything from the cards to tables are decked out with the Full Tilt logo. Even the dealers are wearing red in honor of the casino/poker site. Speaking of the dealers, players can interact with them while experiencing the brick-and-mortar casino feel. Regarding games, there are currently three blackjack tables and one roulette table running out of Riga, Latvia. If you’re a high roller, you can also visit the “VIP Suite,” where the bets get bigger and potential winnings are greater. One more aspect worth mentioning about the games is that you can play generic versions of baccarat and Casino Hold’em. As of now, the Full Tilt live casino is fairly limited when it comes to markets and platforms. The live casino is only available in a few markets such as the UK. The only client available is Windows, however, this should change in the near future with the addition of Mac and mobile clients. The fact that both blackjack and roulette is offered in the live dealer casino section is nice. However, it’s always better to have an even larger variety of games. That said, we fully expect Full Tilt to at least add live baccarat in the future, maybe even Casino Hold’em too. But whatever the case may be, it’s nice to see the famed poker site making bigger moves with their casino operation.